Where are you from? Your profession? For the past 22 years, I have lived on Lake Elizabeth, a beautiful natural lake near Melrose, Florida. I am an Environmental Law Professor and Director of the Environmental and Land Use Law Program at the University of Florida. My entire career has been devoted to environmental protection. I began my career as a biologist, earning a B.S. in Biological Sciences from Rutgers University and an M.S. in Entomology from the University of Florida. After a stint working for the USDA, I went to law school to focus on environmental law and policy. I then spent seven years working as an environmental lawyer for the US Environmental Protection Agency in Washington DC and nine years as a senior attorney for the St. Johns River Water Management District before joining the full-time faculty of the University of Florida. When and how did you become interested in paddling? Since early childhood, I have had a strong interest in and connection to the natural environment. My earliest paddling experiences were in the pine barrens of my home state of New Jersey. 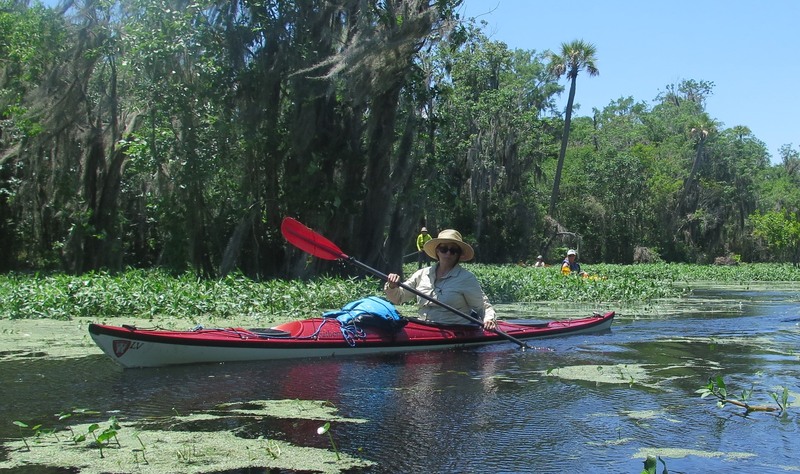 Almost immediately after moving to Florida in the early 1980s, I began exploring the plethora of rivers and springs of North Central Florida by canoe. When I move to Washington DC, I learned to whitewater canoe and spent time paddling in the waters of Virginia, Maryland and West Virginia. After moving back to Florida, I realized that my passion for environmental protection had led me to spend most of my time working on environmental protection and less time out enjoying the natural environment that I sought to protect. I made a commitment to myself to kayak at least once a week every week that I was not traveling. Although I am not always able to fulfill my once a week goal, I do paddle on a regular on a variety of water bodies within a few hours drive of Gainesville. Where is your favorite place to paddle? I have paddled in many parts of the United States, from Alaska to Florida, as well as in many other countries including Zambia, Brazil, Iceland, Costa Rica and Canada. There are so many places that I enjoy paddling that it is hard to pick a favorite, however, one of my favorites close to home is Juniper Run. I love the wild lush feel of it. What’s the most interesting thing that ever happened to you on a paddling trip? Many interesting things have happened to me while kayaking, but two in particular stand out. The first was paddling on the Zambezi River in Zambia when a large group of elephants, including several small babies, decided to block my way by crossing the river in a line, each one's trunk attached to the tail of the one in front of it. Another memorable experience closer to home was on a bioluminescence paddle on Merritt Island, where my boat scared a group of sleeping manatees. The startled manatees looked like giant glowing green monsters and they flooded my boat with their bioluminescent splash. How did you hear about Paddle Florida and what’s your current role with the organization? I became aware of Paddle Florida several years ago when some friends told me about their experiences on a Suwanee River trip. Unfortunately, although I did some scouting for the Ocklawaha trip, I have not yet had the opportunity to join a Paddle Florida trip as my teaching schedule at the University of Florida conflicts with most of them. I am looking forward to an upcoming sabbatical and hope to join at least one or two Paddle Florida trips during that time. I recently joined the board of Paddle Florida and hope to be much more involved with the organization in the future.